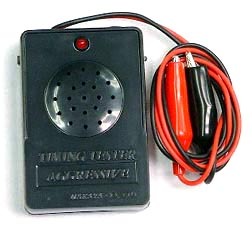 Simply the easiest and most accurate to adjust your ignition timing on any points type system - just connect one lead to ground and the other lead to the green wire coming out of the stator. Rotate the flywheel and a buzzer sounds and a red light comes on as the points open. Also has a battery powered built-in flashlight for viewing inside the flywheel while checking points gap. A must-have tool for any vintage scooter owners toolbox.